Most of us take our safety for granted. Locking our doors behind us everyday to return home to a secure residence is something that many enjoy. We don’t think that much about our locks until we encounter a problem. We don’t tend to think about our security until a reliable lock jams or we find our home broken into. 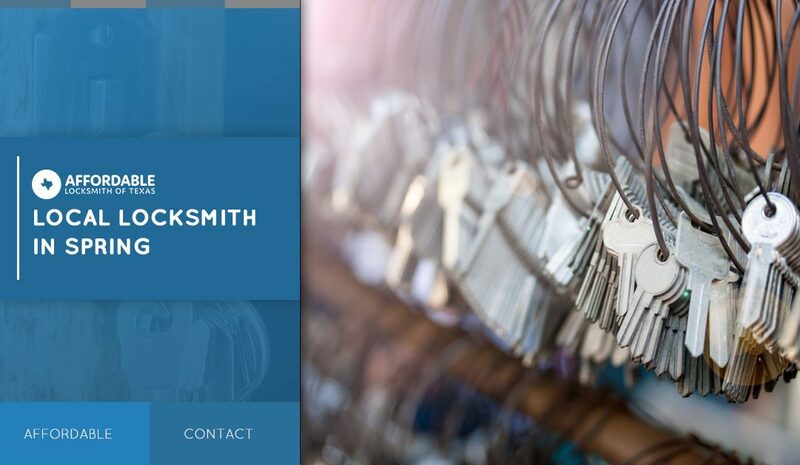 No matter if you’ve recently experienced a frustrating circumstance or are simply wanting to upgrade your security, the locksmiths of Affordable Locksmith of Texas are here for our clients in Spring. We understand that you could choose any residential locksmith to fix your locks. You could even choose to try and fix them yourself. For these reasons, when you choose us, we understand the privilege and always strive to provide each and every one of our clients in Spring the best service possible. Not only do we have high standards for ourselves, but we also understand that when you are locked out or your lock isn’t working like it should, that you need assistance of a local locksmith right away. When you call or contact us you can always expect us to reply within 15 minutes of your inquiry guaranteed. When you call us, you can expect to get the same high-quality services every time. Because all of our locksmiths are vetted and have been professionally licensed, you never have to worry about putting your home’s security and your family’s safety in our hands. Are you locked out or do you need to rekey, or upgrade your security? Contact Affordable Locksmith of Texas, we are your local locksmiths that you can trust. First time clients get 10 percent off their first service! If you are looking for locksmiths who truly care about their clients, who arrive on time, and show up with the proper tools, professionalism, and customer-service attitude every time, contact Affordable Locksmith of Texas today!